We no longer carry the 1979-93 Mustang Maximum Motorsports Front Swaybar. Check out 1979-1993 Mustang Sway Bars for an updated selection. 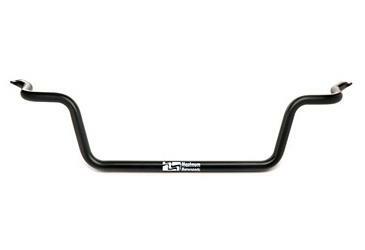 Improve front grip on your 1979-93 Mustang with this new Maximum Motorsports Front Swaybar. We developed the MM Front Swaybar on our American Iron race car. It is considerably softer than the stock 5.0 Mustang swaybar, and works great with the MM Adjustable Rear Swaybars and coil-overs. Lightweight tubular design. Powder coated black. Mounts in the same manner as a stock swaybar. Requires 1-1/8” swaybar pivot bushings. High performance end links are recommended.